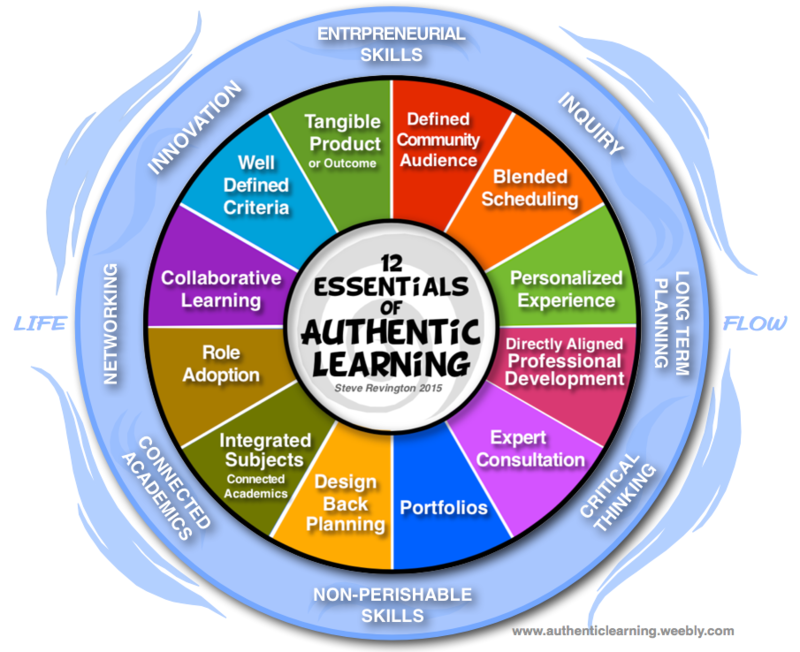 Essentials that are required to create an authentic learning event. Authentic learning is the research, processes, resources, networking and culminating skills a learner needs to attain a genuine, successful meaningful outcome. The outcome must have relevance and be tangible. It also must reach out to a community audience in some way. Here is a list of tried and true essentials that support the implementation of a successful authentic learning initiative. 1. A tangible product. The goal is to produce a tangible product/significant outcome that can be shared effectively with the world. It can be the innovation of an original cookie, an informative podcast or a design for a public garden but the outcome needs to be produced for a specific audience. 2. Clearly defined community audience. It is very important to identify what audience the product and event are intended for. To target an audience provides vital, specific information for you and your students so that planning can be done effectively. ​For example, in performing a quality, school theatrical production a target market of parents, relatives and community is the intended target market and is planned for accordingly. Language and script content that reflect family values need to be carefully considered. The size and scope of the audience will significantly influence the production; stage setting, the viewing optics, the sound quality, the financial and physical investments, the time commitments and all aspects of the organization of the school community. When we consider implementing an authentic initiative, the larger the audience, the broader the scope of learning there will be. The range and complexity of skill sets, the amount of student "buy-in", the degree of non-perishable skills, the level of intrinsic motivation, the degree of collaboration and the depth of learning opportunities expand exponentially with the size of the intended audience. The more authentic the audience, the more enriching the learning opportunity will be. Before any authentic learning event can be started, ground work is needed. Be sure that your product pitch or presentation is valid and that you and your students understand your outcomes for that intended audience. Be sure that your administration, teaching colleagues involved, custodial staff and parents are all aboard and have a clear understanding on what the initiative is, how you plan to achieve it and what are the benefits. It's also a good thing to have each of these shareholders weigh in too as their input can assist your team in defining the audience. It's also recommended to seek professional advice from your community leaders to better understand your target audience. Your school is a community, your county is a community and so is your state/province/country so be diligent in your groundwork. ​Also note that we live in a globally connected world and that a target audience can far reaching. Whether it's contacting experts directly connected to your event or people who have the connections, teachers need to successfully recruit, delegate and consult to achieve quality results. For each authentic initiative, you'll need to build a reliable and skilled team. As all good marketers can attest, know your audience. 3. Design-back planning. Once the product, purpose and audience have been clearly established then a design plan is created to reasonably and comfortably attain the authentic learning initiative's goal. It has to be a shared vision too. A list of specific skill sets required, support information, curriculum connections, human and material resources need to be identified. A reasonable, built-for-success timeline should also be considered during this time. I created schematic maps on chart paper, wall-to-wall displays or on SmartBoards that outlined our intended journey and displayed it for all students to view from the initiative's concept to completion. It's always a good thing to assure your students that these plans are organic and that refining, editing and redirecting is all part of the natural development of achieving genuine goals. Of course the more student input, the more ownership they'll have and that's always a good thing! It's also important to consistently assure students that they feel free and confident to add, edit or share their ideas to improve your plan all along the journey. 4. A well defined criteria. Criteria are the specific, step by step expectations required to achieve a finite, project related goal. The criteria must be clearly defined and specifically aligned with your final goal. When it's relevant learning, with a tangible product to be shared, then quality research, consultation must be sought to achieve your successful criteria. Make it understood that from conception to completion that criteria too may need to be revisited as greater understanding is consolidated. The more researched, authentically based, clear, user friendly and precise the criteria is, the better the outcome will be. Be sure to share your criteria (success criteria) in a variety of ways. I've made them available on chart paper, white board, chalkboard, crib notes, online class web sites, emails and Smartbaords to name a few. Provide criteria that is age appropriate and also time sensitive. By revisiting the criteria regularly it helps provide students with the sense the team is working on a living, breathing initiative. Edits, clarification, add ons all help to define team success and hone quality performances. 5. Role Adoption & Authentic Settings. I can't stress enough the importance of this element. Young children love role playing as we see them engaged in roles as soon as they can walk, talk and interact. Firemen, nurses, police personnel, scientists, construction workers ... it's like a form of heightened creativity when they get to be someone else allowing themselves to be fully immersed in the journey. When doing the "Egg Drop Project" my junior grade students became scientists and engineers. I discovered that their focus, motivation and productivity increased dramatically when they wore lab coats and clip on project clearance badges. Don't think that role playing is a child's activity. It doesn't matter the age as most humans love the feeling of belonging and playing out roles. Putting on a chef cap and apron when baking or a name plate on your desk; that sense of belonging can also help create an atmosphere of higher focus, discipline and belonging. I have observed two perspectives of role playing in an authentic learning model. A) the kind of role playing I've just described - adopting job roles B) role playing as in taking on a role of position within a team. When doing similuations such as a tower building challenge, I ask students to group decide on what positions they'd like to assume for that activity. As an example I may suggest we require the following roles: 1) foreman 2) accountant 3) delivery rep. 4) safety/organization rep. Each has a specific job description and they will discuss and elect which of the group members would be best for the group's success. Of course, just by assigning this selection activity, a variety of teachable moments will emerge. Also, consider creating authentic settings as part of your student's Role Playing. Creating learning environments that reflect and magnify the roles you're establishing are extremely useful. While working towards a medieval market event I've introduced historical props and artwork that we'll be including in our signature event and that tends to ramp up the focus and enthusiasm. It's a strong, quiet message that shouts "this is really going to happen and you're a big part of it!" It separates the talk from the walk and provides an exciting working atmosphere when you're building something together that's relevant and meaningful. Students who have difficulty connecting to regular content-driven learning will start making immediate connections and those who do will be even that more motivated. When your class is designing and making a product create an atmosphere similar to a workshop or laboratory. This immerses your students in a rich, life-like setting that induces relevance and worthiness. I realize that education spans a lot of ages, but role adoption is an often overlooked element, especially with older students. It can activate and actualize learning while immersing students in environments that nurture their skill sets. The absence of role playing opportunities is also reflective of a traditional education mind set. Remember, the closer to real a learning experience is, the more potent that learning experience will be. 6. Integrated Subjects. As in real life situations, most undertakings are not subject specific. A musical band doesn't just make music. There are many skills and disciplines involved in a band performing a successful gig. There's bookings, marketing, advertising, stage cues, budgeting, graphics, lighting, sound mixing, contracts and promotion to consider before the band can perform. Addressing subject specific skills is important, like rehearsing and arranging, but integrating other skills for a band to be successful is paramount. When planning for authentic learning events your subject specific timetable pretty much goes out the window. That doesn't mean you've neglected covering your subject areas, it just means that math will occur as a consistent thread throughout your school day. Many school systems are presently structured into a "silo" or "subject to period" model with extensive rotary and that makes it somewhat difficult to integrate. Curriculum guidelines need to be adhered to, so identifying those curriculum expectations that are directly aligned to your authentic learning initiative is important. Most curricula are developmentally based, so incorporating expectations, with its numerous choices into an authentic learning event is quite doable. Reading, maths, social studies, technology, art, music, drama, health, physical education, science and even the languages will be present in your authentic learning (AL) event. The curriculum is really full of subject integrating opportunities. Teacher partnering is also highly recommended to actualize subject integration. In an ideal world, I'd plan the authentic learning initiative first, identify those skill-expectations required to successfully achieve an outcome, then attach a reasonable amount of academic curriculum expectations that align specifically with that authentic goal in mind. When I implemented The Egg Drop Project initiative, the volume of literacy, numeracy and writing expectations covered were impressive yet the initiative was anchored in Science & Technology. 7. Blended Scheduling. Once you've established your curriculum connections and have all subject areas represented, trust it. No longer will Social Studies happen at 2:15 pm after recess, Social Studies is being sufficiently implemented as your authentic learning event is unfolding. Trust your planning! This may be the hardest thing a teacher has to get used to when their authentic learning unit is in full swing. Consult with your administration and colleagues to create large blocks of time that will allow for creativity and deeper focus to flourish but be sure your curriculum expectations are being represented. Remember, starting and stopping is what a river does just before it dries up. By blending your scheduling you're maintaining a deep, continual flow. Time to go deep is your most valued asset. 8. Collaboration - Team Based Approach. No great thing was ever accomplished without a team. Let your students know this. Authentic learning events are excellent opportunities to develop team skills and you'll need those skills to move forward. The idea of the single genius is mostly a myth. I love to include this dimension when starting on great projects and authentic learning initiatives. Share stories about Thomas Edison's Menlo Park or the development of the game of Monopoly to better understand this. Partnerships, small and large group activities can flourish in authentic learning environments. The real work is preparing them for the challenge ahead with lots of opportunities to participate in team-based simulation games. Implementing team building activities are extremely helpful in developing social interaction skills and introducing cooperative concepts that will be required. Team building should not be seen as an isolated activity, rather an ongoing culminating skill activity over time. Move from simple to complex team building activities as you move towards your authentic event. Attain skills - maintain skills - sustain skills! The best running cars are the ones that are regularly tune-up.No difference with team skills. 9. Personalized Experience. The more personal input the students have, the more ownership they'll have. Within the development of an authentic learning event and a team approach educators need to provide open ended opportunities to allow students to explore their personal interests and creativity. Even though the student may be part of the bigger team, it is important that their uniqueness be honoured. Even if their partner(s) are working on the same product their experiences and perceptions may be quite different. Give the students opportunities to share what they may have done differently if they were working on a project on their own. I'll provide post-project modification opportunities to assess the synthesizing of knowledge and skills a student developed over the event period. Maintaining student portfolios that include curriculum based work sheets, self reflections, team assessments, individual research, sketches, photos, creative writings, collected articles and personal notes all support the personalized experience. I also encourage enrichment extensions to any student who would like to pursue a personal interest related to their work once their core work has been completed. The Living Museum concept is such a terrific opportunity to develop a team based goal and provide an amazing personalized experience. There is a plan to create a medieval atmosphere in our room, the halls, class room entrance and our class web site. In brainstorming sessions we get their ideas out, weigh their viability and revisit the ideas again before the final design reveal. To do their part at the market, students prepare to be trades person with authentic personas. They need a medieval trade, trade sir name, costume, family lineage, a market stall and a tangible product or tool that they will display and be working on for open house day. Every student creates their own story. Students seeking a higher level pursuit may take their blacksmith character to greater authentic depths by visiting and working with a real, local farrier (horse blacksmith) to create a product. What they create and display at the Living Market Museum will be the real thing and it will be proudly their own unique experience. 10. Portfolios. Portfolios are collections of papers and artifacts of learning that support student research, record ideas, drafts, contacts, consultation notes, lists, diagrams, work sheets, reflection notes, articles, dimensions and even budgets. It is here that integrated subject work sheets are placed. They are essential in the work place just as any designer or executive would have them. If time allows, I'd spiral bind student portfolio into a published version for sharing at the initiative's end. I found that the students loved them when presented in a professional format! At times, I'd partner with my librarians to bar code and place published student work in the school library. It peaked the interests of other students and teachers and also provided a quality model of finished school work for others to view. 11. Master Consultation. Once an authentic outcome has been identified and after the design-back planning of the skills and resources have been determined, connecting to experts in the community who can provide quality input is essential. The sum of the quality skills, expert consultations, resources, workmanship and effective planning that goes into producing the product/outcome is always equal to the success of that product. Remember, it's not authentic unless your students are directly interacting with the world beyond the school walls. This becomes the litmus test of whether its' authentic learning or not. Many teachers believe they are doing an authentic learning task just because they are referring to a real world scenario. Either the community comes in to share your student's product or they go out to the community to share their product. To complete tasks in real world scenarios require presentations, workshops or direct interaction with a community expert. No successful pursuit can be achieved unless thorough expert consultation, networking, quality resources and skill development has been acquired. These are teachable skills! You can't get consultation if you can't ask! It's important to provide students with basic instruction on how to network and be able to secure master consultation. Of course, age appropriate expectations need to be implemented and adult supervision may be required but it is an important skill set to teach. Students need to know how to target the expertise they require, to ask effectively and politely for advice, to research and identify people with expertise in the community and how to do it safely and efficiently. It may begin by implementing role playing activities as students engage in simulated networking scenarios, progressing to engaging with older students and then to adults in your school community to assist development of these skills. 12. Professional Development. As the teacher's role becomes less of a content dispenser (the sage on the stage) and more of an event coordinator, consultant or facilitator, it is very important for educators to be open to project specific professional development opportunities. The teacher isn't expected to be the expert of all things and rightly so. If, as an educator, you feel that by learning a new software, connecting your learners to a pertinent App, learning a new skill that is directly connected to your authentic initiative then there are numerous benefits. It may be learning a new video editing computer program for your students' music video project or a book publishing apparatus, but the impact of this professional development is immediate and meaningful. It's also relevant professional development that can be successfully transferred to other learning initiatives down the road. You may feel that you're out of your comfort zone when planning an authentic learning event. Good, then you're really a genuine life long learner. You do have options to help you pull it off. One is to take instruction in the area of expertise you'll need to succeed or network and connect with someone who already has the skills to share. This may be a guest instructor or a class visit to an actual business where students can learn specific skills. Don't forget that your students come from a resource rich community, parents are great resources and there will be many on your school staff that have unique talents too. I'm a strong advocate for all educators to go outside the education system to learn new skills and processes. I wish our educational systems would recognize that learning a non-board initiated skill is a very valuable choice as it's a skill from a primary professional source. If we're trying to be true to an authentic model of learning, then we have to lead by example. We have to be the life long learners we talk about to be able to inspire our future life long learners. It's walking the talk! Be that impactful coach or that highly connected consultant. It's may take some personal, professional development time but it's essential to your students. Many professional development sessions (PD sessions) provide ways to deliver more content, provide classroom based activities and interpret statistical data on large groupings of students. It's the meaningful adventures, however, of learning a new skills, a craft, a useful software or hardware outside the system that will have an immediate, meaningful and lasting impact. We need to become more integrated with our communities to maintain our genuine understanding of what's going on in the real world and to properly prepare our students for the real world. It's also a very positive goodwill gesture to show interest in the community. Remember, the community today can be a national or global community. By connecting on 'FaceTime', 'Skype' or Google's 'Hang Out' for example, the world got a lot smaller and with proper preparation the professional development that's out there has never been so vast and accessible. By providing these 12 essentials Authentic Learning opportunities can fully be realized.